View of Thankot (in the valley) from the top of trail. Kathmandu in the distance. Chandragiri Mountain, situated in the southwest corner of Kathmandu, is one of four mountain passes into Kathmandu Valley. Before the Tribhuvan Highway was built in the 1950's, travelers and traders followed a well-worn route from the village of Thankot in Kathmandu, over the pass to Chitlang, then across the Tarai plains into India. Today, a new cable car whisks people straight to the top of Chandragiri, avoiding the difficult ascent from Thankot. 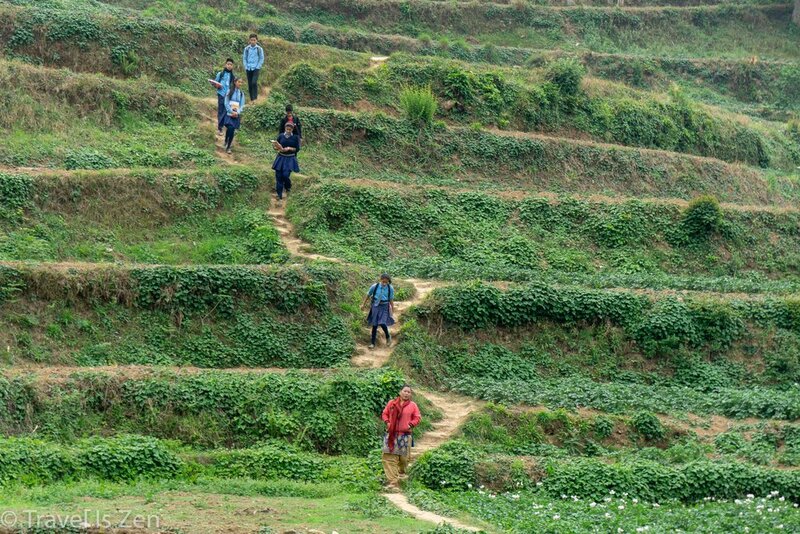 The hiking trail to the top of Chandragiri Mountain still exists, though, as does the foot path to Chitlang, so we decided to take a short three-day trek out of Kathmandu to see some sites. 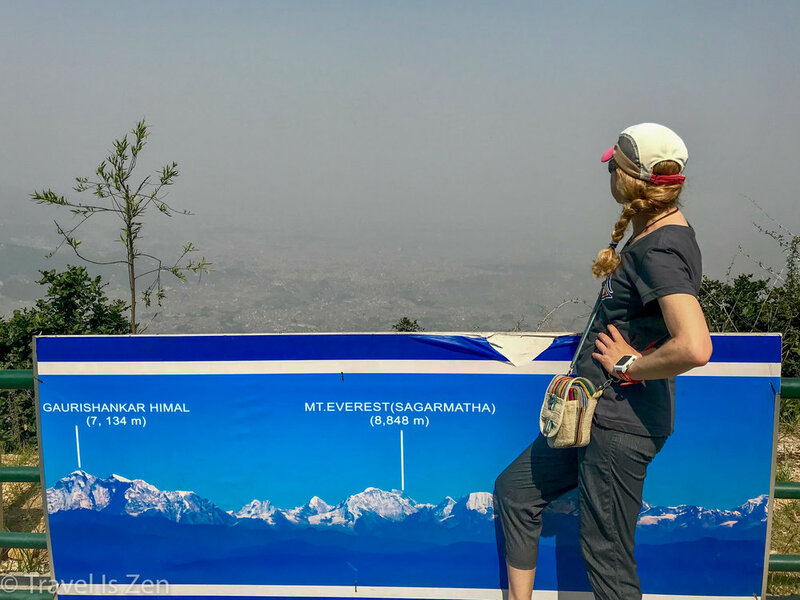 First we hiked from Thankot to the top of Chandragiri, hoping to see the reported "panoramic view of the Upper Himalayas" ...unfortunately, Kathmandu Valley is filled with dust and pollution and we saw nothing. Mt. Everest is RIGHT THERE! Behind the smog! The newly-rebuilt Bhaleshore Mahadev Temple of Lord Shiva, though, was worth the strenuous climb. The Gorkha King Prithivi Narayan Shah worshipped on this site before conquering and unifying the three Newar valley kingdoms of Kathmandu, Bhaktapur, and Patan in 1768. 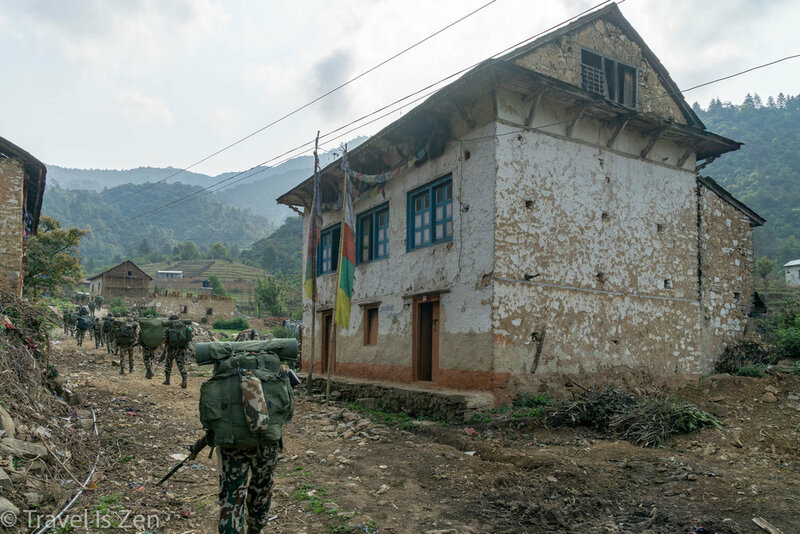 The country we now know as Nepal was called Gorkha until its official name change in 1933. Look at the beautiful sky here - compared with the smog that blankets the valley. Sad. We walked back down to the actual Pass and took the trail down the opposite side of Chandragiri Mountain to Chitlang (3 miles from the Pass). 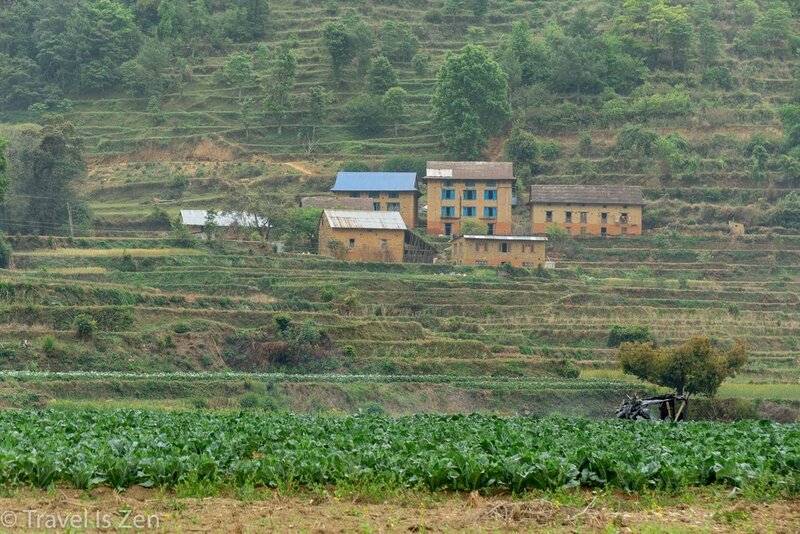 Chitlang is an ancient sleepy town with a mix of ethnic groups: Tamang, Magar, Chhetri Braman, Newar and Gurung. You can see the distinct housing styles of each culture in the valley. While they live harmoniously as neighbors, they rarely inter-marry. 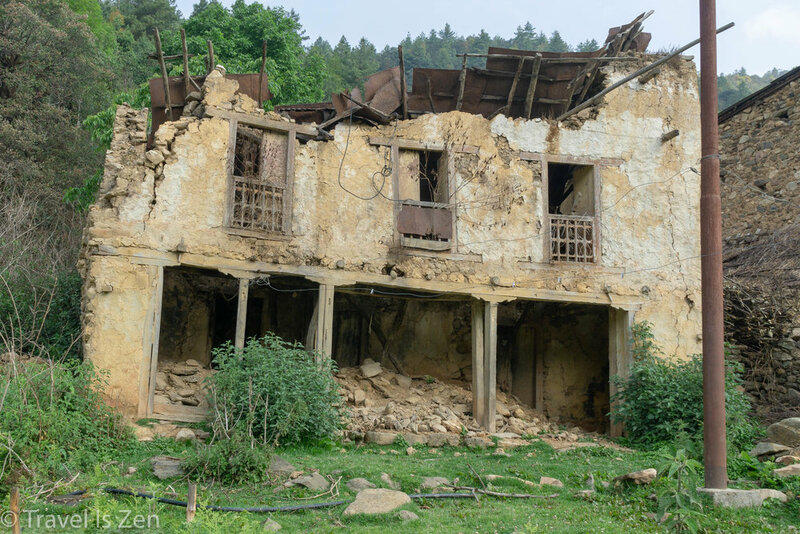 Chitlang was hit hard by the earthquake that rocked Kathmandu in 2015 and many of the traditional homes were damaged beyond repair. 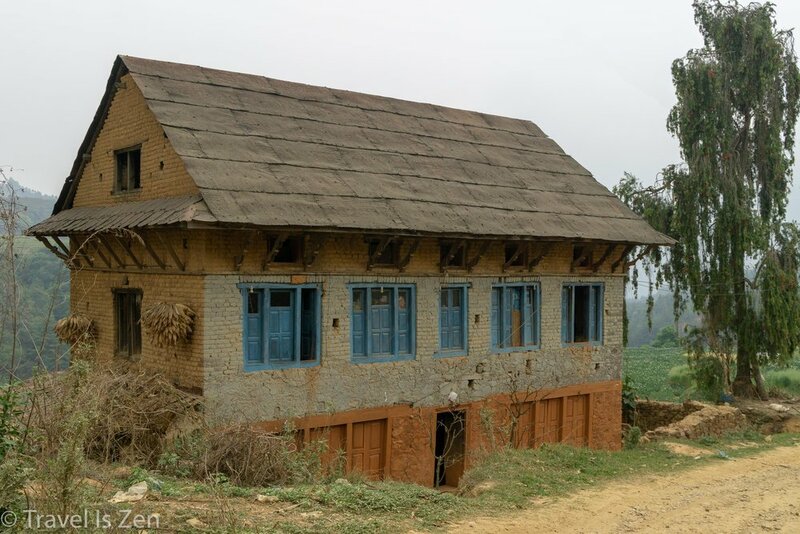 The villagers are rebuilding, taking the opportunity to modernize and expand their homes as inns to accommodate the local visitors from Kathmandu who flock to Chitlang for R&R on the weekend. A new road will soon link Chitlang to Thankot and the cable car, as well, making travel here even easier. The character of this lovely village will certainly change in the coming years. 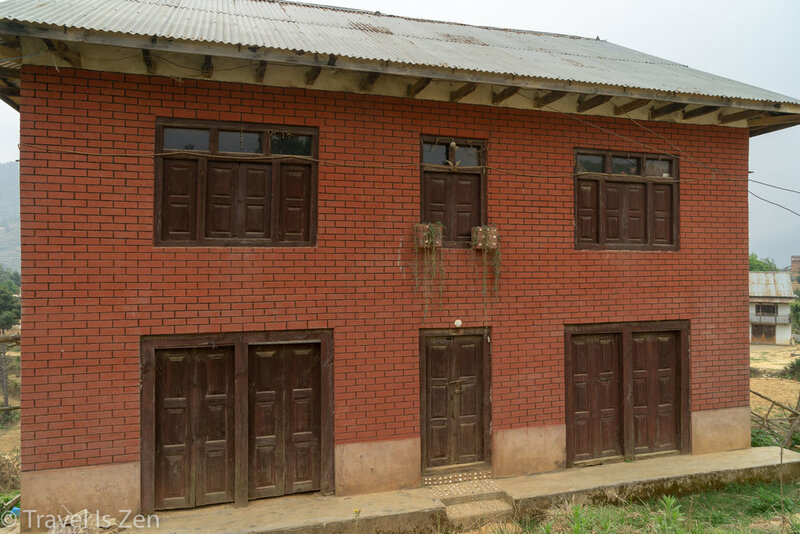 We stayed at a homestay in Chitlang for two nights. 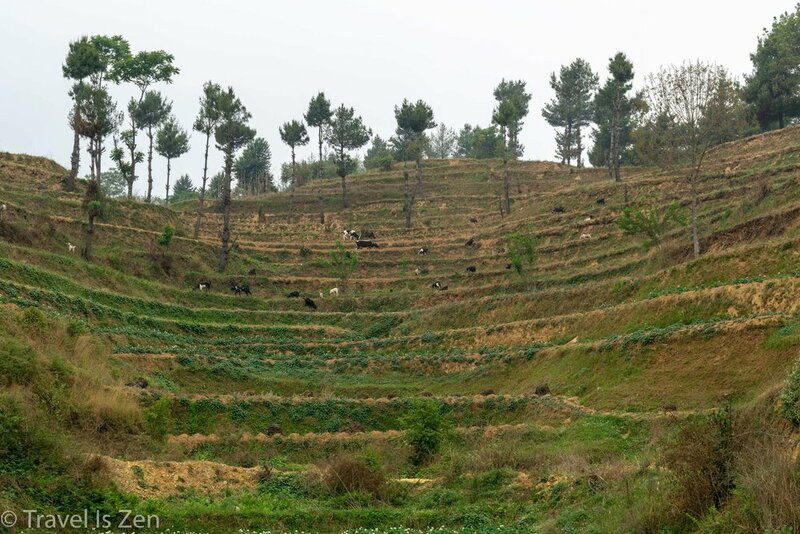 On the second day, we hiked the new road to Markhu, past terraced fields and thin pine forests. In Markhu, there's a large man-made lake for kayaking, swimming, and boating. 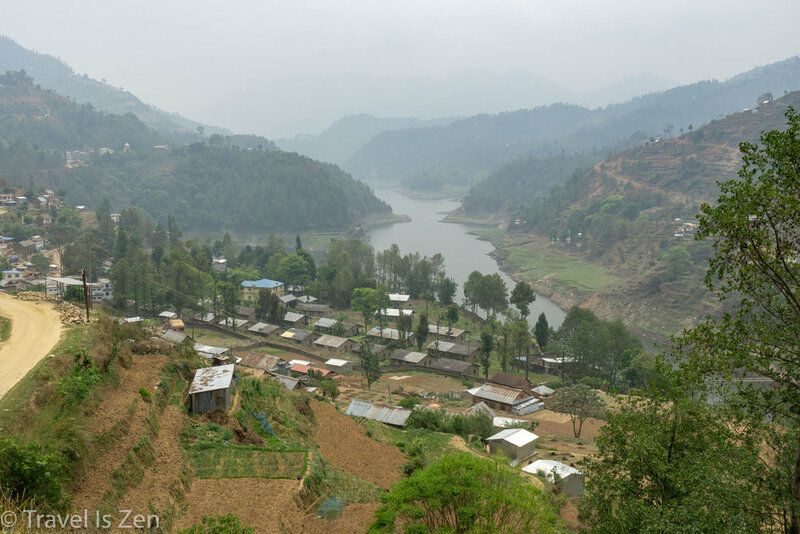 The Kulekhani reservoir was created to power a hydroelectric plant on the opposite end of the lake; alarmingly low water levels contribute to the frequent power outages in Kathmandu. 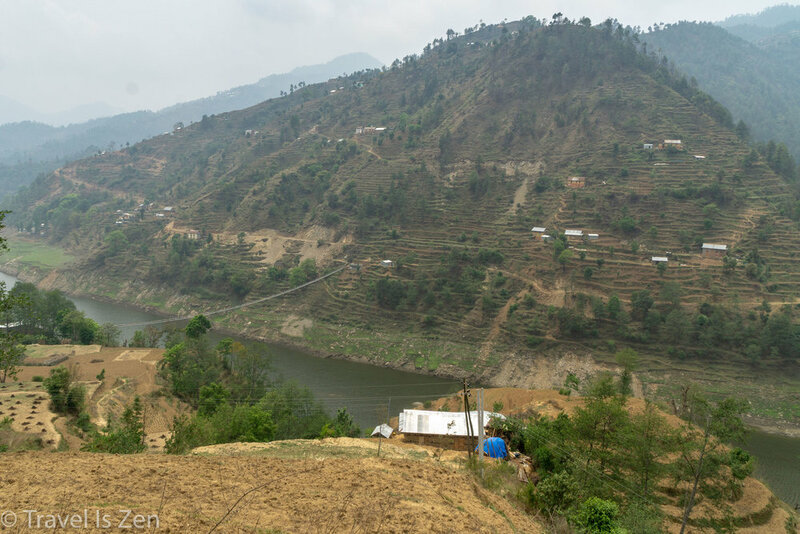 We walked across the suspension bridge for a better view of the lake, took a few photos, had lunch and then returned to Chitlang (round-trip hike 11.5 miles). Peaceful, quiet place! 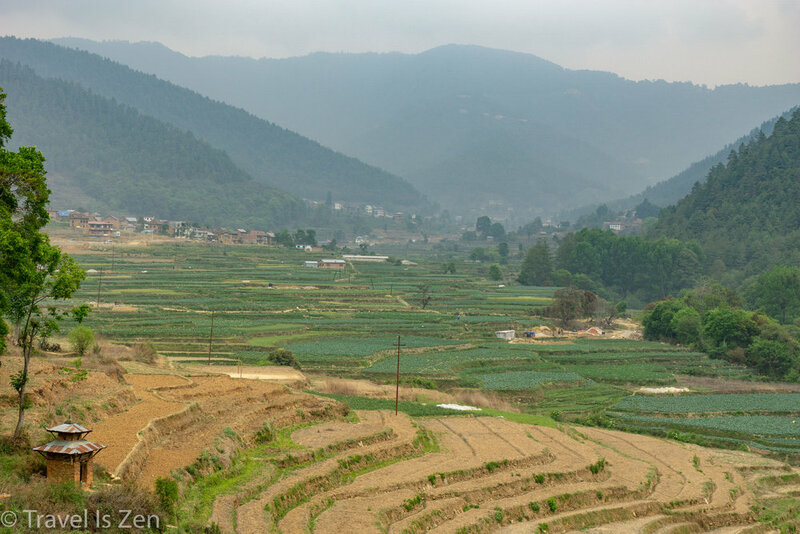 The following day, we hiked back over the Pass to Thankot, returning to the smog of Kathmandu. 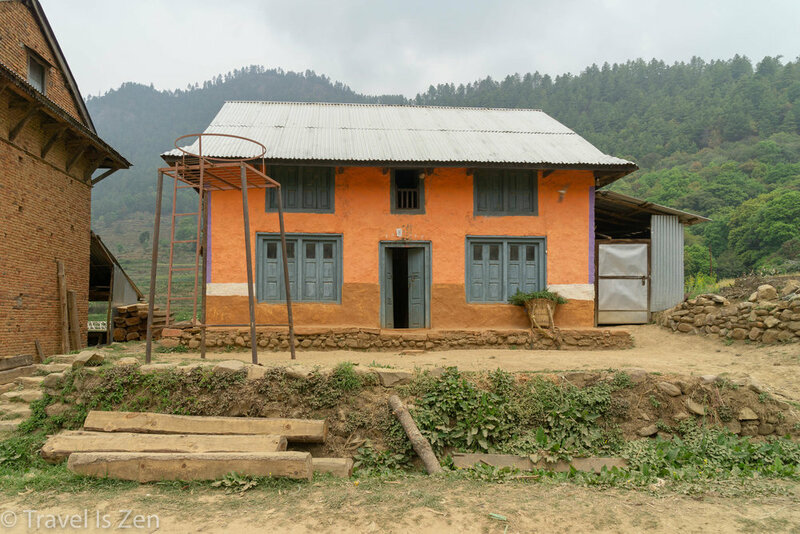 Chitlang and Markhu are a terrific place to escape for some fresh air and exercise if you are staying in Kathmandu for an extended period of time. We took a local bus from Ratna Park to the Police Checkpoint near Chandragiri Cable Car. It's one mile from the checkpoint to the cable car entrance. Do not go into the cable car park; rather, take the dirt road to the left of the entrance and follow it through Thankot village. There are no signs, but if you simply ask "Chitlang? ", people will point you in the right direction. There is a road being built between Thankot and Chitlang, but it is blocked in several places by construction landslide debris. DO NOT TAKE THE ROAD (in Spring 2018). 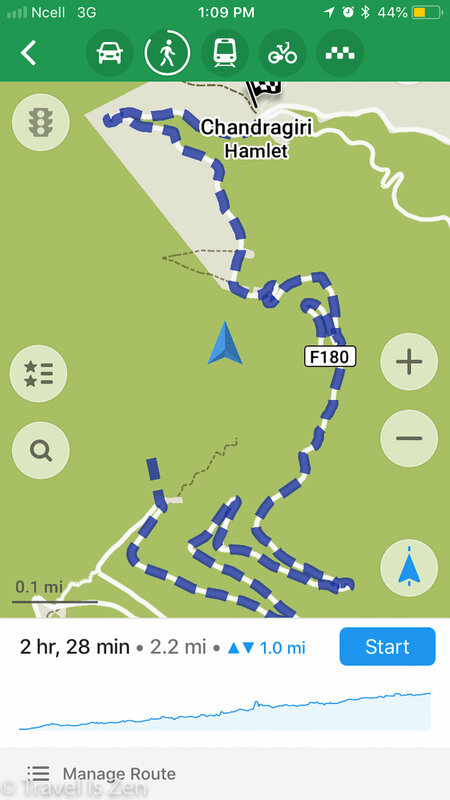 Take the very steep one mile trail, which will intersect with the road much higher up. At the road, proceed left (uphill) to the top of the Pass, which now intersects with another road-in-progress. Turn left to go to the top of Chandragiri; continue straight across the road and down the narrow trail on the other side to get to Chitlang. 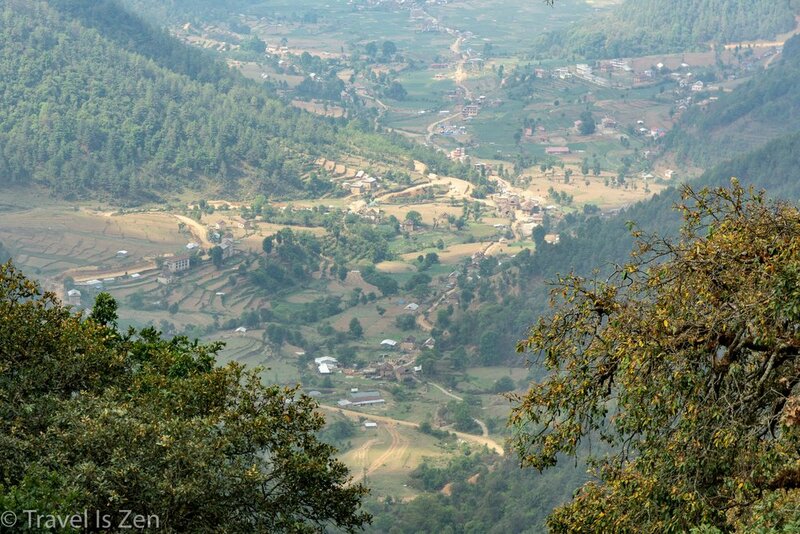 From Chitlang to Markhu, simply follow the new dirt road; at the fork just outside of Chitlang, proceed to the left.